Hello everyone! Hope you all celebrated Vinayagar Chaturthi ( Ganesh Chaturthi) by presenting your sundal and kozhukattis (modaks) to the Lord Ganesh and got his blessings. I made black channa dhal sundal and sweet pongal to make Ganesha happy too! Okay now, from all my previous posts you would have almost concluded that I’m a vegetarian and this is going to be a vegetarian blog. Sorry to give you that perception. I like non-vegetarian dishes equally as vegetarian and I love fish more than chicken and lamb. Living in a country that has fishing as one of the biggest businesses, I should say I’m loving all the different varieties of fish I get to eat here. My husband makes really yum Indian style fish fry and that is a regular in our weekend menu. 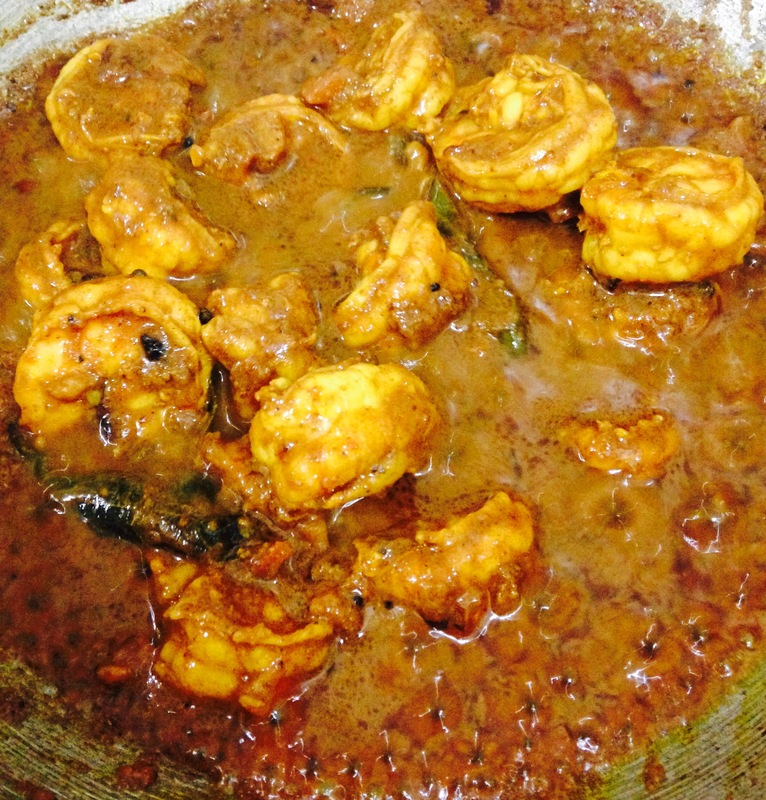 We recently got prawns from the fish market with the a plan of making prawn briyani, but then I wanted to try a different recipe.So, the first place I went to is “At The Corner of Happy and Harried“, a food blog by Anjana. I found her blog on a random search on the Instagram and I should tell you, it was a love at first sight! The pictures and her writing is truly awesome and inspiring. And I’m sure you will love the recipe as much as I enjoyed cooking and tasting. 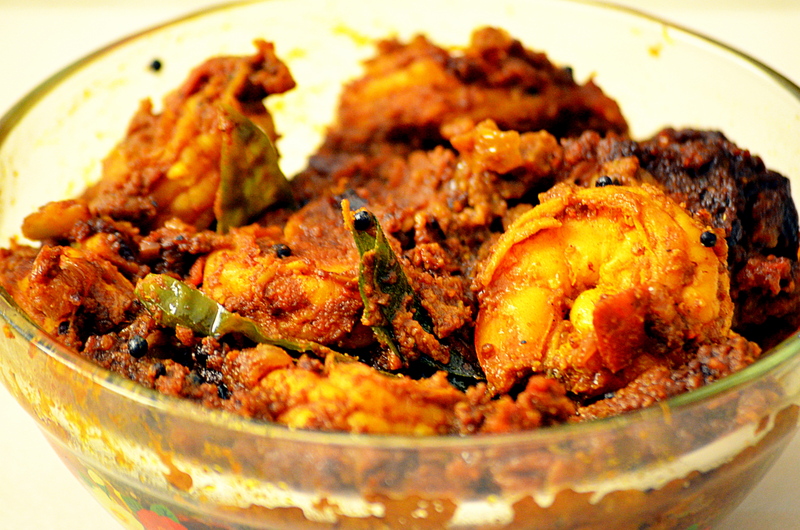 Today I am presenting you one of Anjana’s recipes – Cumin based Prawn Roast. This is really different from our regular curries and tastes well with hot plain rice and dosa. Cumin powder is the base ingredient in the dish. Cut the head and tail of the prawns, peel the skin and wash it with salt and turmeric. I used 1/2 kg of medium-sized prawns. Marinate the prawns with salt, turmeric powder, pepper powder and few drops of lemon juice. Refrigerate till we get other ingredients ready. Dry roast cumin seeds in a kadai at a medium heat. Grind it to a fine powder. Soak a small lemon-sized ball of tamarind in warm water. Take puree and keep aside. Chop onions, tomatoes and green chilies. Crush ginger and garlic. Heat oil in a kadai, add mustard seeds and curry leaves. Add onions and fry for a minute. Now add, green chilies and crushed ginger and garlic and fry till onions turn transparent. Add turmeric powder, red chili powder, coriander powder and the freshly ground cumin powder. Fry them till onions turn brown and the raw smell of the masala powders go off. Now throw the chopped tomatoes and fry until it turns mushy and blends with the masala. Add the prawns,tamarind puree and required salt and increase the flame to cook them. Once the gravy gets thick, simmer the flame and keep cooking till the oil oozes out. Add 1/2 spoon of garam masala and toss everything together. Switch off the flame and transfer it to the serving bowl. Tip: Using coconut oil to cook adds the original Kerala flavor to the roast. So, what’s cooking in your kitchen this weekend? Do you have prawn recipes? Write to me at dharsinisekar@gmail.com. The shrimp looks awesome, glad you liked the recipe. Thank you for mentioning my blog in the post. But I would appreciate it if you provided a link back to my blog and the specific blog post as well, since you have used my recipe. I have mentioned all this in my blog’s Copyright page. Thank you! Hi Anjana! I have added the link to your blog and sorry for not doing it earlier. And the prawn roast was a hit. Thanks!